For licensing reasons I run a 2 node cluster with 1 quad core CPU per node. Each host has 8 NICs. I’m using 2 for VM network traffic and want to use 2 for the management network. I wanted to use the other 4 NICs for multi NIC vMotion. To save switch ports, I connected both hosts directly. Because I saw no reason not to use jumbo frames, I wanted to set this up too. Now, to enable the vMotion proces to make use of all the uplinks, you’ll have to assign one VMKernel port to one vmnic only. It works kind of the same as the software iSCSI setup. Thank you Duncan for explaining this in detail. Just creating a vSwitch with one VMKernel portgroup and assigning multiple uplinks won’t cut it. This will only use the multiple uplinks when vMotioning multiple VM’s. 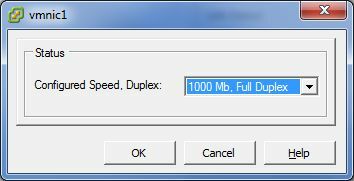 One vMotion per uplink. In multi NIC vMotion, all uplinks are used for every vMotion. Ok, let’s get started. To make things easy for yourself, make sure the UTP cables are connected to the same NIC ports on both hosts. If the hosts are installed in the same manner, the physical ports shoud map to the same vmnics. 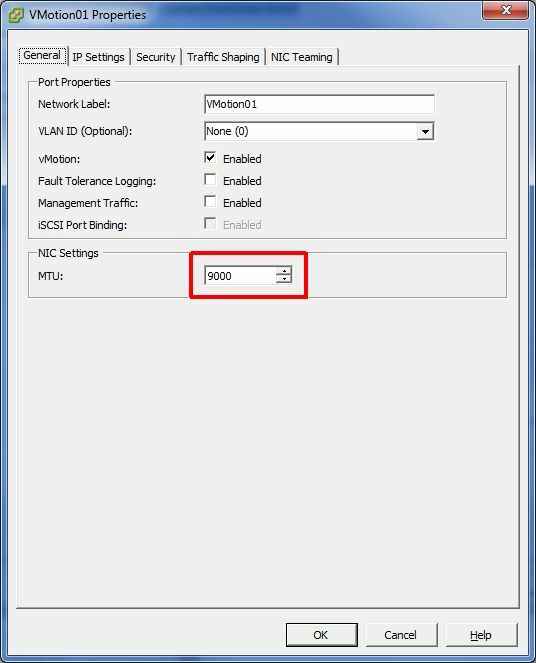 In my example, I’m using vmnic1 & vmnic2 of an Intel 82850 quad port NIC and vmnic5 & vmnic6 of a Broadcom BCM5719 quad port NIC. 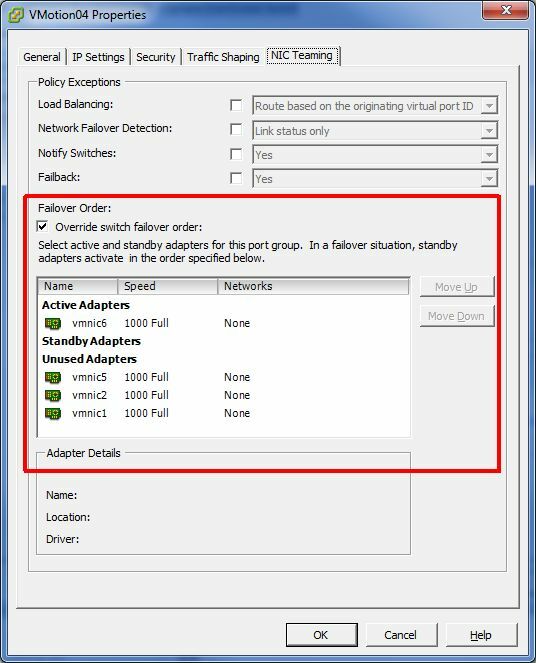 Although the vMotion capability is not that critical of an operation, there is no reason to not take into account the same redundancy best practices as you would apply on your VM networks and management network(s). It’s never comfortable to have an interrupted vMotion because one of your NICs fails. Because of auto-MDIX you can connect the NICs without any risk. I have, however, configured 4 vmnics in one host as ‘1000/FULL’. The 4 vmnics in the other host are configured to ‘Auto negotiate’. 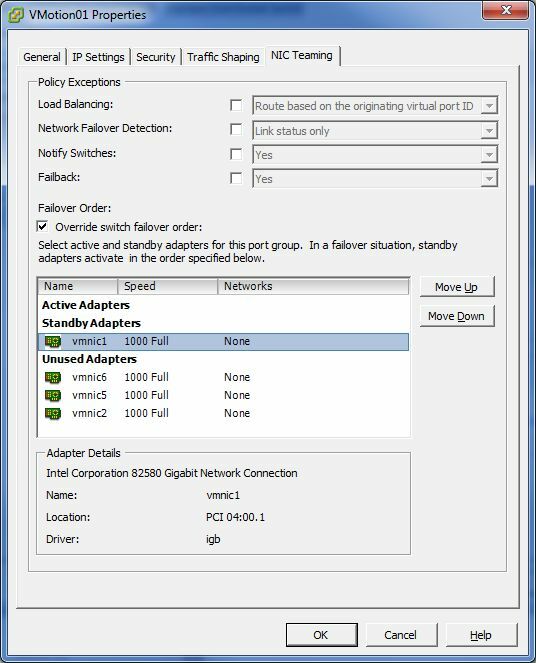 Create a new vSwitch with 4 VMKernel ports. Add the vmnics to the vswitch (vmnic1,2,5,6). AND on all 4 portgroups. 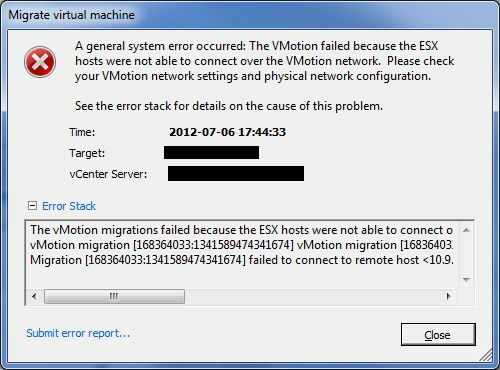 The vMotion migrations failed because the ESX hosts were not able to connect over the vMotion network. 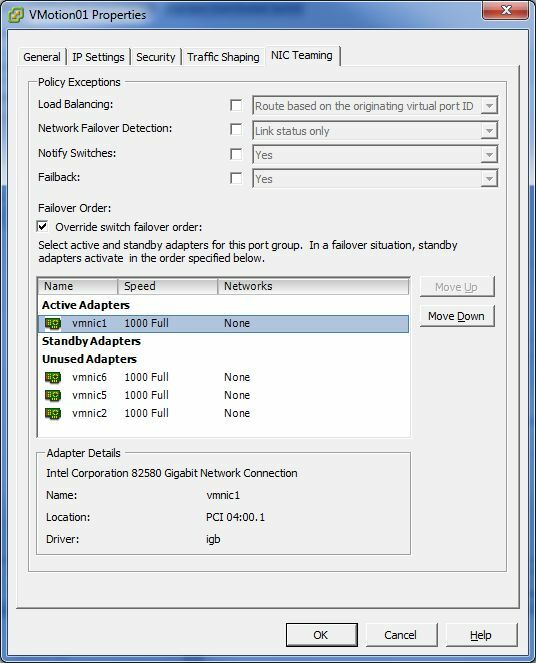 Check the vMotion network settings and physical network configuration. Module Migrate power on failed. The error is correct, the ESXi can’t connect! Think about it. 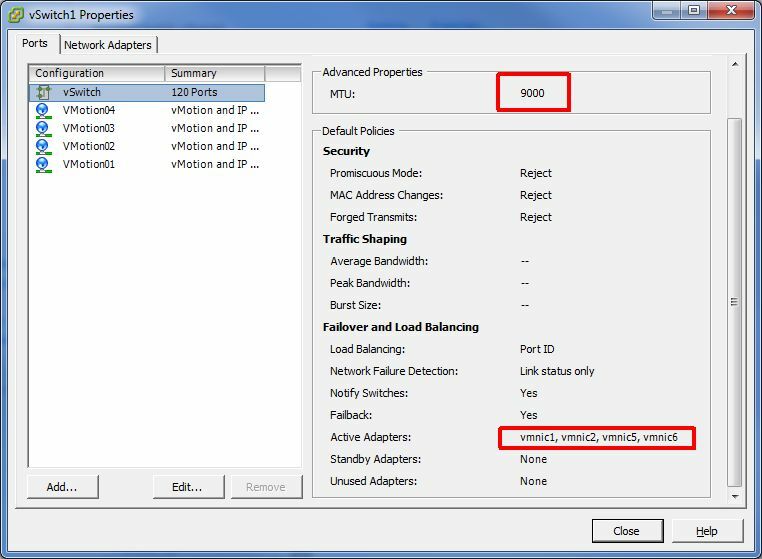 Even though you seperated the portgroups and connected the NIC’s with a directly connected UTP cable, there is nothing in VMware that prevents it from connecting randomly to one of the other 4 IP addresses from the other host for the vMotion operation. You put them in one /24 subnet didn’t you? This is exactly the reason why these settings will work when you have the hosts connected to a switch, but not when you use a directly connected cable. To solve this, you’ll have to create seperate networks for every VMKernel portgroup. I recommend using /30 networks. I haven’t tried /31 networks, but I can’t really see a reason why you should use them. Maybe one of you can comment. 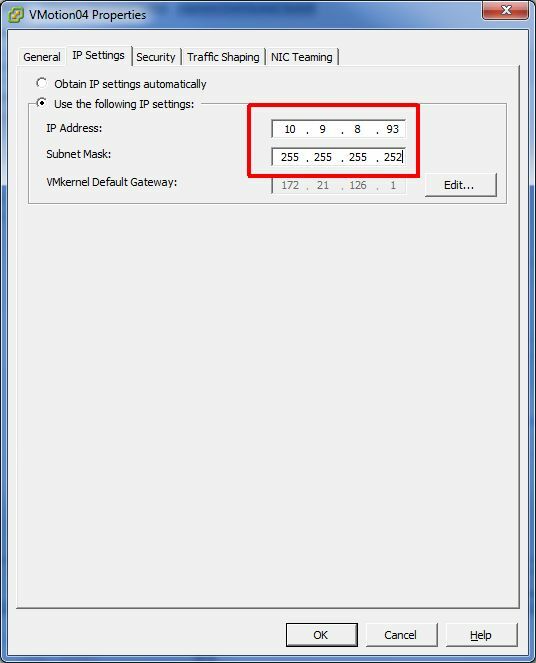 To make it easy to choose the correct IP addresses for hosts, use this cheat sheet. So I created 4 networks. 10.9.8.0/31, 10.9.8.28/31, 10.9.8.60/31 and 10.9.8.92/31. I assigned the 2 IP adresses from each subnet to the VMKernel portgroup on each host. The subnet mask is 255.255.255.252. This way you make sure, there is only 1 possible connection. Each IP connection can only exist between the IP addresses on both ends of the directly attached UTP cable. 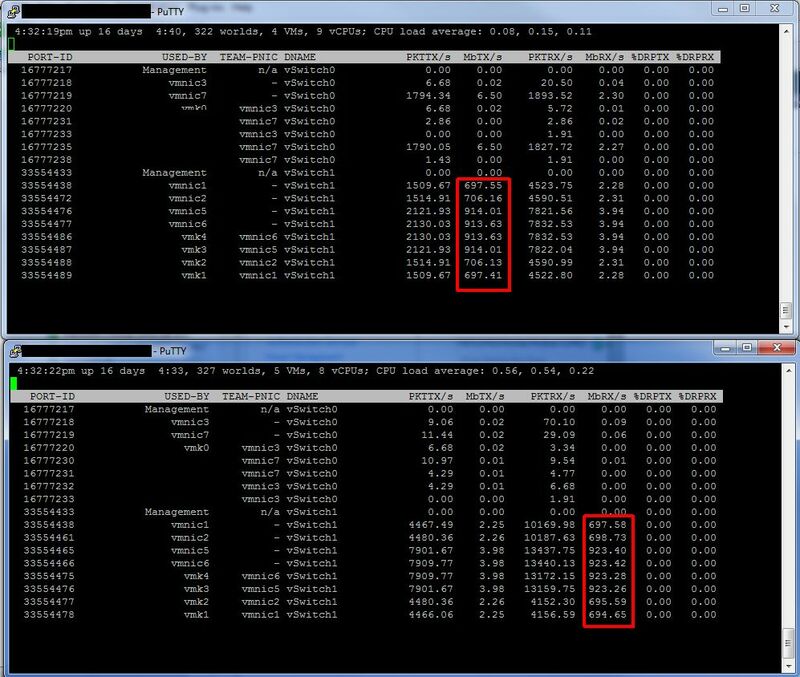 This is the reason why you should mark the other vmnics as ‘unused’ instead of ‘standby’ in the failover order on the portgroup. It is impossible for each vmnic to take the place of another in case of a failure. and then change it back to active again. I only had to do this on the rebooted host. I’m still not sure why this is happening. 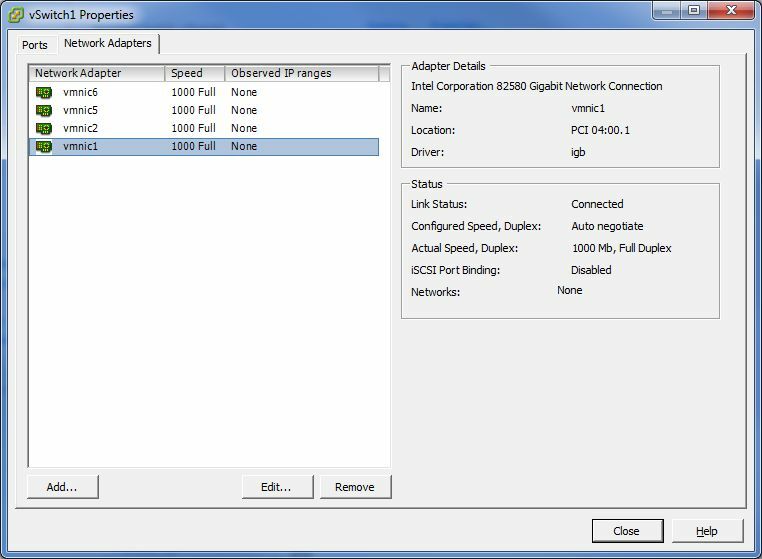 It seems the binding of the IP address of the port group occurs on all adapters at boot. If that is the case, this would certainly be a bug. Made a reader can comment? NOTE: Problem is reoccurring See note above for a solution to this problem.